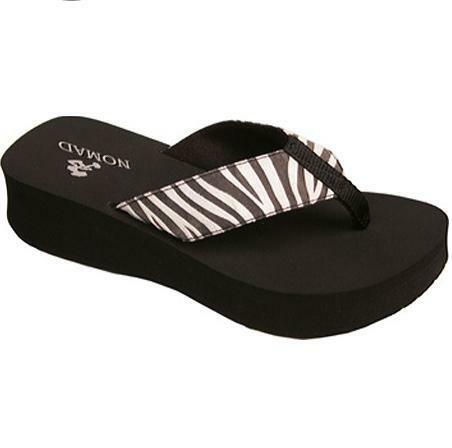 Once you slide your feet into these Zebra sandals, you will never want to walk in any others again. This cushiony and lightweight sandal will prove to be your staple for whenever you go out. The upper strap is lined with an animal print micro fiber, which provides a nice comfort to your feet. Do you recall the most versatile, comfortable shoe you ever bought? The shoe that spoke to you and called your name? It would not be surprising for that to have been a Nomad shoe. From cork styles to canvas tennies, Nomad has been by your side since 1997 when they came out with the signature fat foam EVA thongs. Since then, Nomad has grown above and beyond, but still cherishes their roots. Wander off and be a NOMAD.